Jim Nordstrom brings more than 50 years of aviation experience to his role as President/General Manager of Copperstate Turbine Engine Company (CTEC) and Glendale Aero Services (GAS). Jim is one of CTEC’s three founding members. 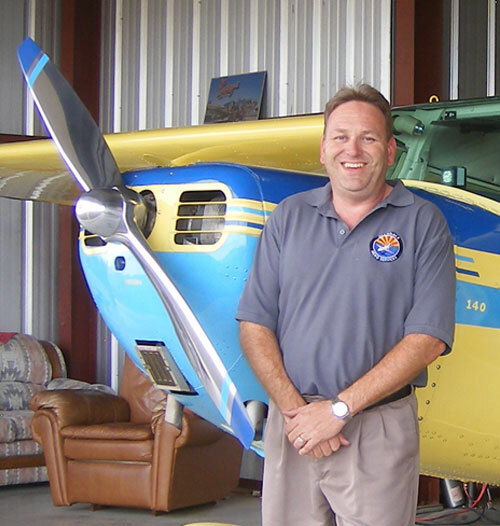 Carl Brandenburg brings a 25 year background in general aviation and airline operations to his role as Operations Manager at Glendale Aero Services. Carl began flying in 1990 with a background as a FAA Gold Seal Flight Instructor, Corporate Pilot, Airline Pilot, Airline Manager and small aircraft owner. He spent 12 years with America West Airlines in positions ranging from Ramp Agent in St. Louis, MO, to Senior Manager of Operations in Phoenix, AZ. Carl also was a pilot for ExpressJet Airlines (Embraer 145), and a corporate pilot (King Air 200). He has been the FBO Manager at Glendale since 2008 and has been flying at Glendale airport since 1996. Carl holds a Bachelor of Science degree from Central Missouri State University. Carl currently owns and flies a vintage Cessna 140A. He lives in Goodyear, AZ, with wife, Kenette, and son, Carl, III. Put yourself in the customer’s shoes, and ask yourself: ‘What are my expectations?’ Next, be sure to exceed those expectations, do it at a fair price, and make sure the customer knows they are appreciated. John Fisher brings 27 years of aviation experience to his role as Director of Maintenance, Glendale Aero Services. 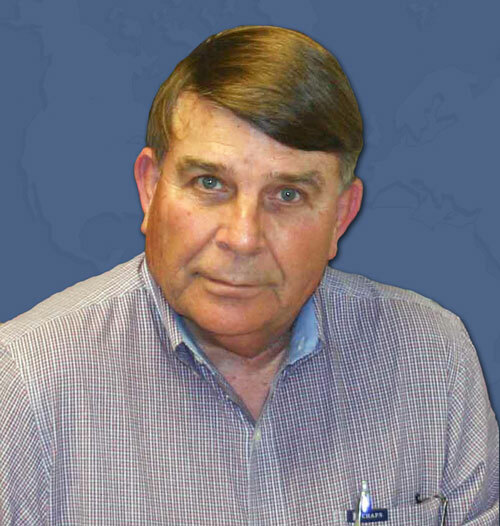 John’s expertise includes general aviation’s piston-powered single and multi-engine aircraft as well as turboprop and turbine-powered aircraft. Prior to Glendale Aero Services, John worked for Executive Aircraft Maintenance, Scottsdale, AZ; Hawker Beechcraft, Mesa, AZ; ARINC Direct, Scottsdale, AZ; Arizona Aircraft Maintenance, Lake Havasu City, AZ; and Wiseman Aviation, Flagstaff, AZ. 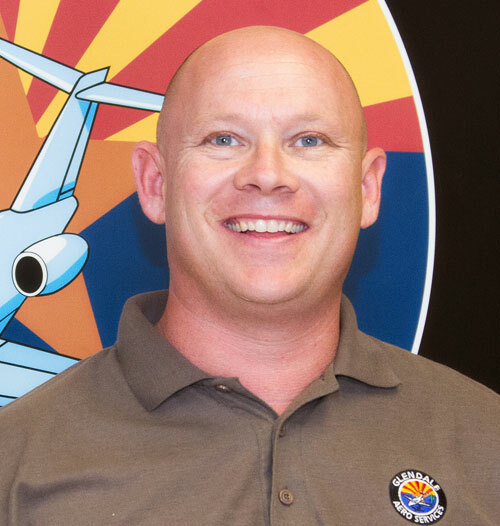 John holds a Bachelor of Science degree from Northern Arizona University, a private pilot certificate, single and multi-engine land, instrument-rated, A&P certificate and inspection authorization. John started in aviation at an early age (2 weeks old to be exact) flying with his father all over the country in the family C-182A. He soloed in gliders at the age of 14 and earned a private pilot certificate at age 17 in his father’s Cessna 210. He is now the sole owner and operator of the C-210 and has carried on the family tradition by taking his son for his first flight in the C-210 at the age of two weeks old. John and his wife, Elizabeth, have two children – Parker and Addison. The Fisher family loves the outdoors, hiking, fishing and camping whenever they get the chance. I believe that honesty, safety and clear communication are the keys to success in this business.